After months of hard work, I’m so excited to share the first photos from our DIY white painted kitchen cabinets project! This phase of the effort involved late nights, early mornings, countless trips to various hardware stores, and even a few tears. Seeing these photos, I feel like all of the hard work truly paid off. I’m no longer overwhelmed by this room since we’ve effectively created the perfect blank slate. 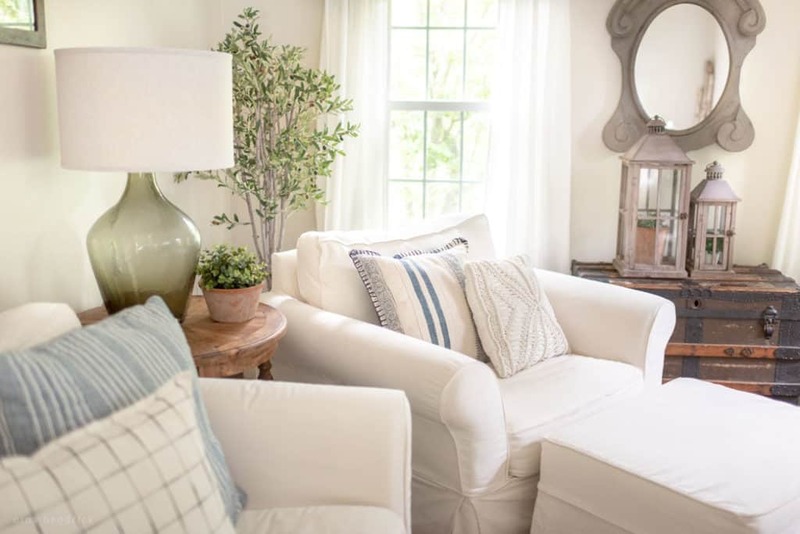 I can’t wait to begin decorating the room in a style that I love! We truly did this project on a budget. I will go into more detail about the budget tomorrow, but by saving on big ticket items- painting the cabinets and keeping the countertops- we were able to get our dream kitchen for hundreds instead of thousands. This left room in our budget for the new appliances and materials to build an island, neither of which were part of the original plan. This is going to be a very photo heavy post, but I will be linking and following up with detailed posts about every project in this room. It was by far our biggest DIY project to date, so there’s a lot of material to share. We learned a ton during this project, and I hope that by detailing our trial-and-error, I can save you some time if you want to tackle this project too! A full source list can be found at the bottom of the post, so if you’re curious where I got something, that’s the best resource! It doesn’t even look like the same room, which is a definite relief! The comparison is astounding to me, it is just so pretty and clean looking now. I’m going to take a little while just to soak in the blank slate before I begin adding decor. With that being said, I do realize it’s a bit stark. I have a long-term plan to bring in some warmth and texture. The farmhouse sink is the Ikea Domsjo. We had this sink in our last home, and it was such a good value that we decided to get another. You can read my answers to some of the commonly asked questions about the sink here. We built this furniture-style kitchen island ourselves. The marble top was a Craigslist steal find by Mack. You won’t believe how little we paid! 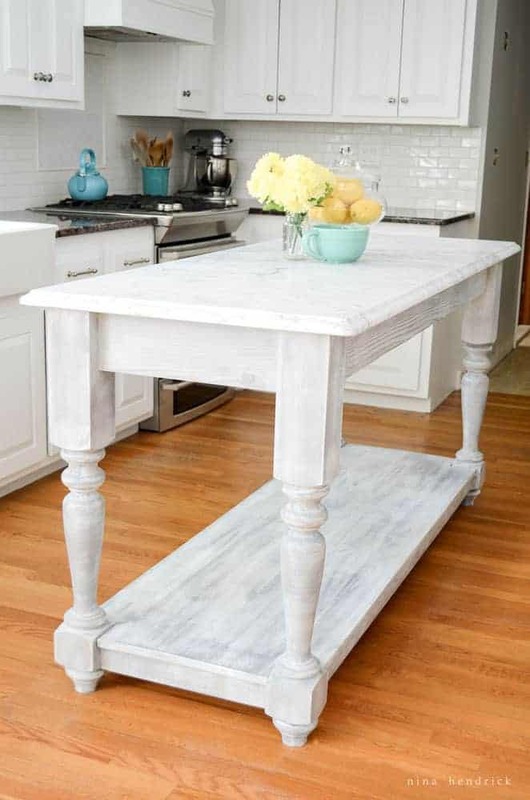 Read the details and get free plans of our DIY Kitchen Island here. With all of the money we saved by keeping our old cabinets and granite, we found room in the budget for a trio of new appliances. You can find the details in the source list at the bottom of the page. This is the Arabesque Backsplash Accent. I had wanted to do the whole backsplash in this tile, but Mack thought it was a little much. Adding a small square accent above the stove was the perfect compromise! Mack built this incredible range hood cover to fit over the cheapest stainless steel range hood we could find. The storage area was all his idea- I was ready to sacrifice that space! You can see the tutorial here that details how we built it to integrate with the existing cabinet and ducting! The dark and dreary linoleum hallway still needs some work, as well as the utility closet (the wood doors you can see at the end of the hall). However, just having the kitchen cabinets painted white seems to have brightened up that space, too. The following post contains affiliate links for your convenience. Please see my disclosure here. This light was originally oil-rubbed bronze. After some deliberation, I gave it a new finish with spray paint to better match this kitchen. If you want to save time and energy, this light is already a similar style and finish. Although there are still a few items left for this room (ceiling, floor, curtains, and more accessories) it feels so nice already, and we are so happy with the progress. I feel like I have a whole new kitchen, but for a fraction of the cost. Mack is especially proud of his range hood cover, and rightfully so- it was an awesome idea! 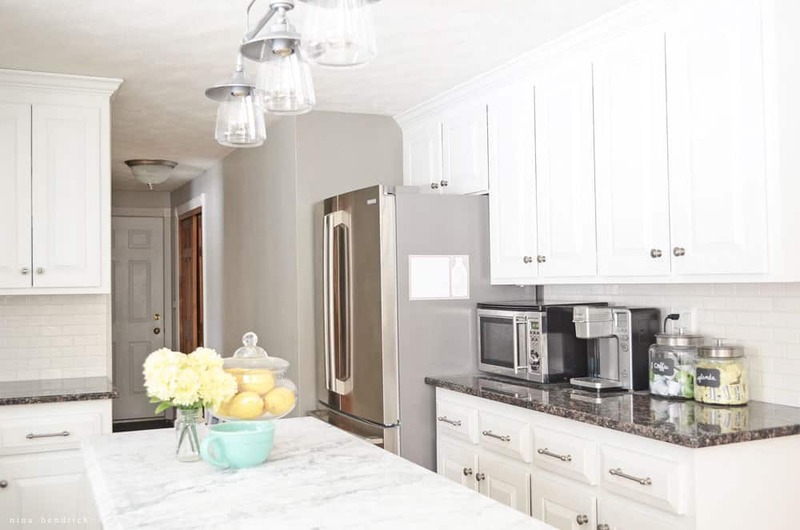 – Learn how we painted our cabinets here. Absolutely stunning Nina! The all white is beautiful and that island is gorgeous you built my dream kitchen! Fantastic job to both of you! Hi there. Wow what an absolute transition. The white is so beautiful. Question. 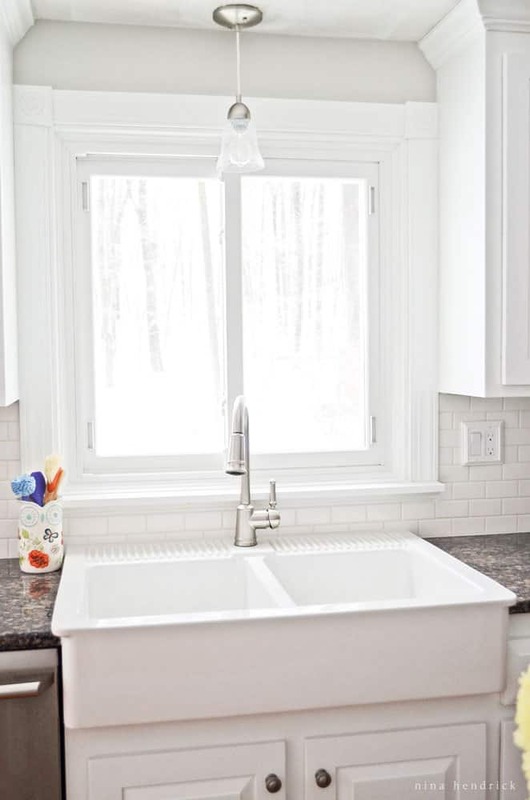 What type of blinds are hanging in your window above the sink? I am looking for something for my windows in the kitchen and i like that look. So exciting to see the finished product! I look forward to the tutorials-always an inspiration!! I can only get the first link to post and really would love to read the one about cabinet painting. Thank you, it looks wonderful! This came out amazing! 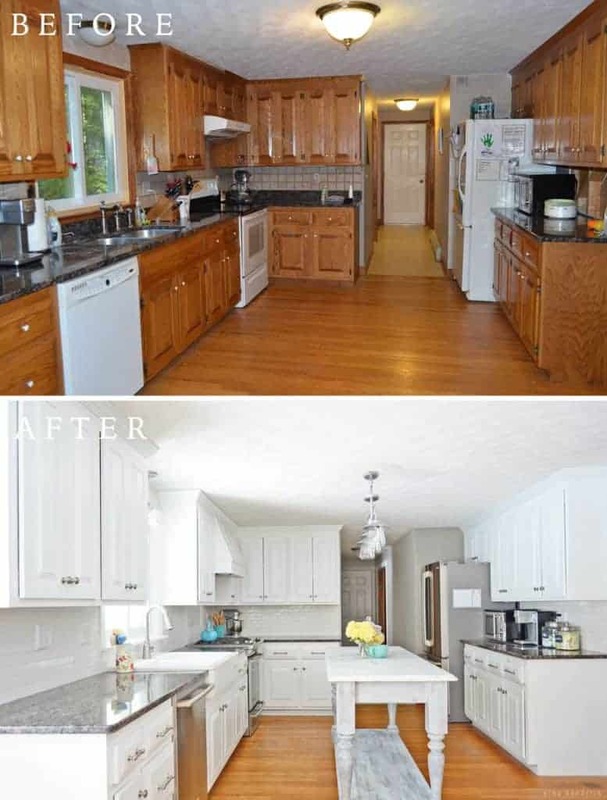 I know you are going to write a post with details, but I’m curious- did you use a paint sprayer for the cabinets? I love love your kitchen. We hope to paint our oak cabinets soon. Where did you get the light fixture? I’m curious to know how you turned the lamp from bronze to beautiful. Absolutely fabulous! You guys did a tremendous job, updating all the right things and doing such high quality work. Bravo! I envy you your energy! Thank you so much for your kind words, Erin! Thank you SO much Lucy!! :) I love your blog! I was drooling over the kitchen and then I saw how your hood cover operated my heart stopped! OMG WOWZA! I love this! Your kitchen is gorgeous! And that range hood with the storage is genius! I love it! Thank you so much Allison!! :) And thank you for hosting such a fun link party!! I have to admit I found you on creating with the stars! I am on there too! But your post really stuck out to me> I am in the middle of re-doing my kitchen very much like yours. We have dark cherry cabinets and they are going white. We just spent this weekend looking at appliances. I love the hood and really want to know the details! Thanks for all the ideas. I love the Ikea Sink as well, it’s farmhouse style but modern at the same time! Beautiful transformation! Thank you so much Lesley! Best wishes for Creating with the Stars :) I am on pins and needles waiting for the time to pass! Hi Nina, So glad I found your blog….love your style. I too found a very similar mable slab through craigslist, and you wont believe the price…$20.00. I know it was a happy day, mine is not as pristine it looks more like honed marble, i have decided i love both looks!! As long as its marble, Right?!! I noticed in your kitchen you added an ikea farmhouse sink, which I love. Do you have a tutoral on how you added that? I noticed you have granite countertops with. an undermount sink in your before pic, so obviously someone cut the granite to install that beauty. I want to add that to my kitchen where I also have an undermount. My question, was it a diy or did you hire someone to cut and install that? Thank you so much Jackie! WOW $20?! That’s amazing! Congrats on the find! I do not have a tutorial on how we added the sink, unfortunately. Honestly, it was a bit squirrelly, and we definitely could have easily wrecked our countertop-so I wouldn’t recommend it unless you hire a professional. We were lucky, it didn’t crack, but we took a big gamble- keeping in mind that I was half hoping for a new countertop ;) We watched this video: https://www.youtube.com/watch?v=vwNeDzLaSCk and followed his methods using a diamond grinder blade. There were some chips on the edge of the granite, but the lip of the Domsjo covered them up. I hope that helps! I’m not sure but it looks like you removed the granite trim piece from your countertop. The part on the wall. How well did that come off and did it leave any marks on the granite? Was the wall damaged at all? We bought a town home with the same granite and oak cabs. I’m not that fond of this particular granite but will need to keep it. 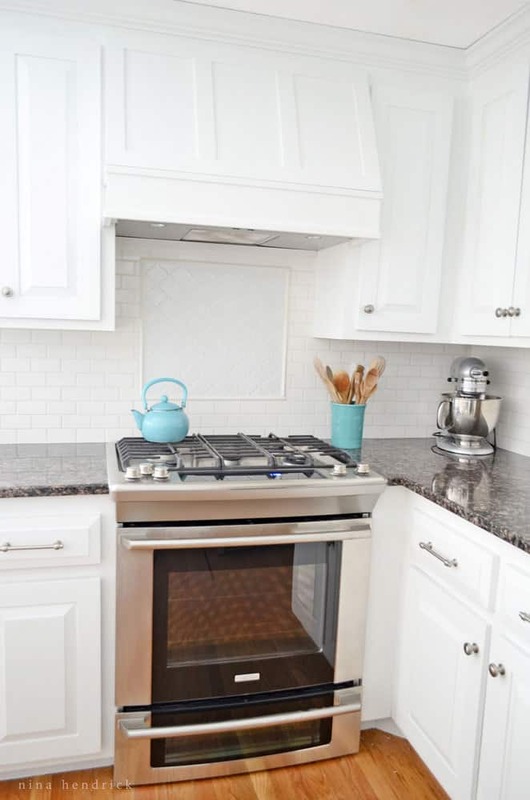 I love the look of your subway tile back splash! Hi Patty! It depends how well the granite installers put it on. This is one of those cases where you’ll be happy if they didn’t put it on well :) Ours came off with minimal damage to the drywall- every so often the silicone took the outer layer of drywall with it, and we would have had to fill it back in. Ours was a bigger mess because removing the travertine was a nightmare- but if it hadn’t been there we probably would have filled those holes with extra mastic when installing the subway tile. It looks spectacular! What a gorgeous transformation. I have a question that I didn’t seen answered here so far. 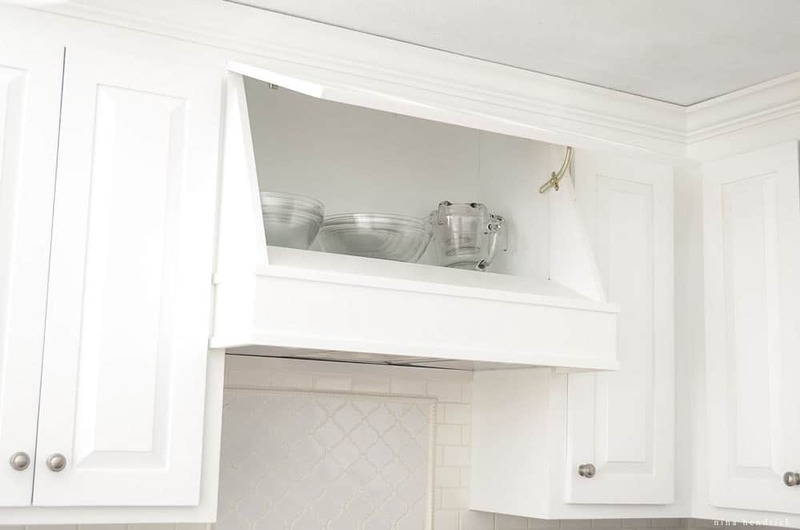 It looks like you changed your hinges on your cabinets so that they’re hidden vs. exposed. What size/type did you have, and what kind did you use to hide them? Was it difficult to swap them out? I’m working on painting a client kitchen, and I know they would love to swap out the hinges, so I’m doing some research on their behalf. :-) Great work! Hi Jenny! Changing the hinges was a bit of a process. Our cabinets were partially inset with a 1/4″ lip. We had to first add a thin filler strip so that they would sit flush. Then we had to figure out the correct angle for our overlay before we ordered the hinges. We worked with Blum (http://www.blum.com/us/en/01/20/10/) and they had excellent customer service to help us figure out the particular angles and corresponding parts we would need! Our particular parts probably won’t be of use to you- there are thousands of combinations- but they will help you find the right ones based on your specific measurements. We ended up eventually ordering the Blum hinges from Amazon, as it was the best price. I’ve attached a photo link of the filler strip and recessed space that the hinge went in. As I said, it was a bit of work- but I think it really helped give the room a more professional look. I hope that helps! 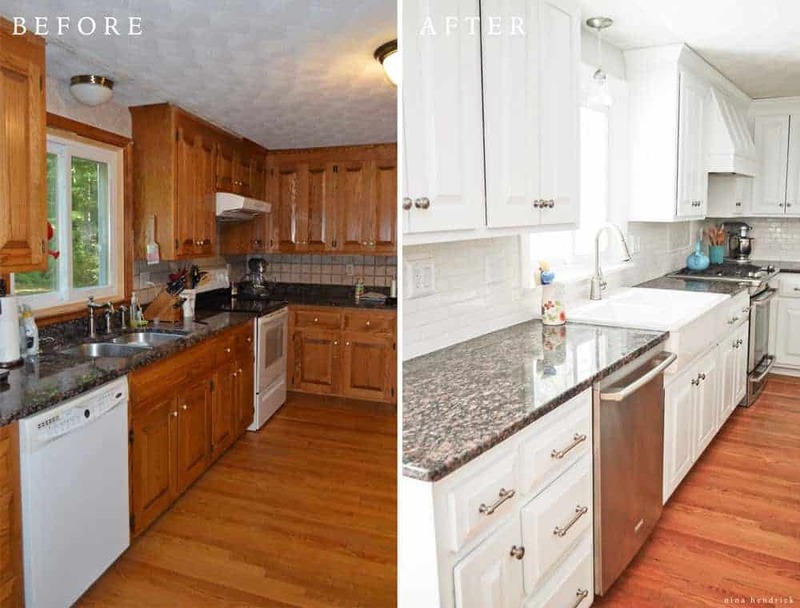 Your kitchen makeover is absolutely remarkable! Your family should be so proud of all your hard work! Love your kitchen!! SOO much cupboard space!! Absolutely love the range hood. I am going to forward that on to a friend who is in the midst of planning their kitchen redo. Your island is phenomenal. Would not know this was not something already made and just resurfaced. I would suggest lightening up the bottom shelf of the island as it is stealing attention due to the contrast of values. You kitchen as a whole rocks! 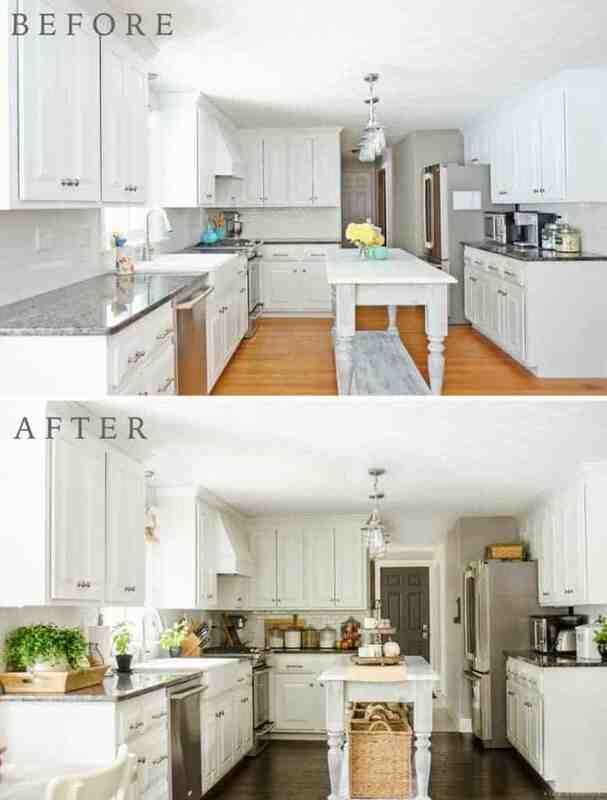 Love your kitchen and is almost identical to layout and look of what my husband and I want. Could you tell me the dimensions of your kitchen? I’d love to put in the exact same Island as yours but am not sure there is enough width between cabinets. Thanks so much for the awesome inspiration!! How do you like the island light? 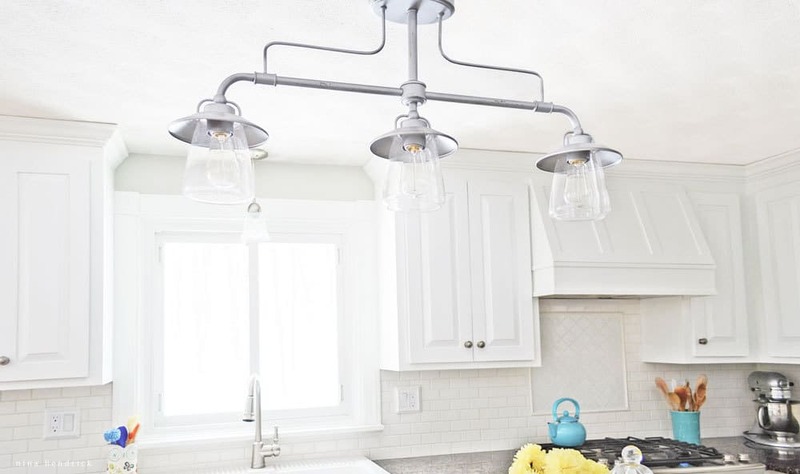 I have been thinking about getting it for ours, but I was worried that the clear glass would make the lightbulbs so bright…or that I would have to get lightbulbs that aren’t bright enough. It is one of only two fixtures in our kitchen. Any advice/reviews you have would be great! Great job and thanks for the info. What was the color you chose for the cabinets? But, long story short, we used Insl-x Cabinet Coat in the stock white color. If I did it again today I think I would have them tint the paint a bit warmer (like Benjamin Moore’s Simply White) because it can be very bluish/cool when the lighting is bad. They will tint the paint any Benjamin Moore color. I hope that helps! This is fantastic! Where did you find your drawer pulls? I have seen those on HGTV makeovers and cannot find them in my searches. I was so happy to see them in your kitchen and hope to finally know where they come from. Hi Debra! They were from Lowes, we bought them right off the shelf- You can find them here! LOVE your kitchen! I did a very similar make over and love it! 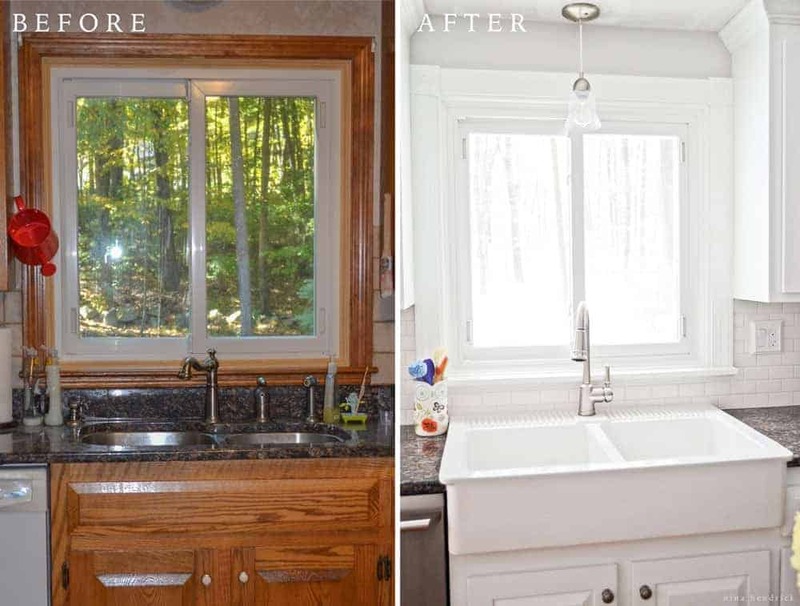 Question: I see in the before picture you have an undermount sink and have a countermount farm sink in the after photos. How do you like it? I’m in the same situation and want a farm sink but since we’re keeping the same countertops, trying to get an undermount in between the countertops and the top of the base cabinets is proving difficult. My husband suggested an IKEA double bowl farm sink. I love the look but wasn’t sure about the countermount transition. Your thoughts? Thank you! Thanks Carol! I LOVE my ikea sink! This is the second house we have installed it in. To add it to this kitchen we did have to cut the countertops in place using a diamond grinding disc, which was something that granite fabricators we spoke to warned us against adamantly(apparently people have cracked and ruined their granite, so our official stance is that we recommend trying to find a professional willing to do it for you). In our case there was chipping, but it was completely covered by the lip of the Domsjo sink. Other styles of farmhouse sinks would have allowed the damage to show. We also sealed under the lip of the sink with silicone caulking. Because the sink is so heavy, we reinforced the existing cabinet using 2x4s and the hardware provided by Ikea. I am so happy with it- I hope that helps! The room looks so great! What a transformation! I am painting our cabinets (and have been since March). This gives me some added motivation to complete the project! It will be worth it, right?! It is so worth it in the end Michelle! But definitely a ton of work! Where did you get your drawer pulls? Hi! Your kitchen looks stunning! Congrats on an awesome job! Hi Allie! We ended up cutting out the drywall behind the backsplash and replacing it (you can also use tile board) and here’s more info on our kitchen sink area! Good luck! Absolutely beautifully done! Looks professional!!! Beautiful! I realize this is a year plus after your original post but I am desperately trying to find a faucet to put on my new Domsjo sink and I love yours! Pretty ones aren’t easy to come by! Do you happen to remember where you got yours from? Thanks so much! I absolutely love your kitchen! What color paint and brand did you use? I have gotten so many suggestions to roll on but I’m planning on spraying the cabinets. Thank you!! Hi Christine! We used Insl-x Cabinet Coat! You can read our full tutorial here, and there’s also a free ebook. Best of luck! I see that the link for the paint for the cabinets is just “white”. 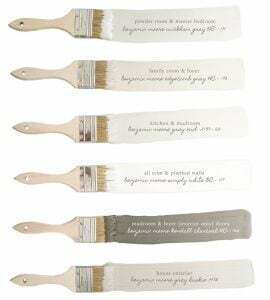 Could it be that easy for that beautiful paint color without being to stark-white. However I do not see the color choice for the grey walls. You have heard it a thousands times, your kitchen is just beyond beautiful! Hi Rhonda! Thank you for the kind words :) Yes, the cabinets are plain out-of-the-can white- although I would probably add a tint if I did the project over again. The wall paint color is Benjamin Moore’s Gray Owl. I’m not against the Advance, just simply impatient. :) We were also painting our cabinet interiors and shelves, and wanted to be able to have our kitchen back more quickly than the Advance would cure. We have since used it for other projects that weren’t shelves and it has held up beautifully. Hi Nina – Thanks for your reply. For the same reason, I am planning to switch from Advance to CC. What did you use with CC – Satin or Semi Gloss. I used the semi gloss CC for my bathrooms, they look very good. Planning to use the same for the kitchen but I heard from the BM salesman that 60% people use Satin for the kitchen. I know it will hide more and look better in Satin but the cleaning will be a lot easier with Semi Gloss. Balance between cleaning and looks I guess. We went with the satin, it has a nice sheen! Like you said, we thought it would hide more. But I think it’s just a matter of preference. So beautiful! Love the look of this kitchen. These kitchen cabinets are so beautiful. I am inspired with your work and can’t wait to try this. Thanks for sharing. Your kitchen is so pretty and gorgeous. 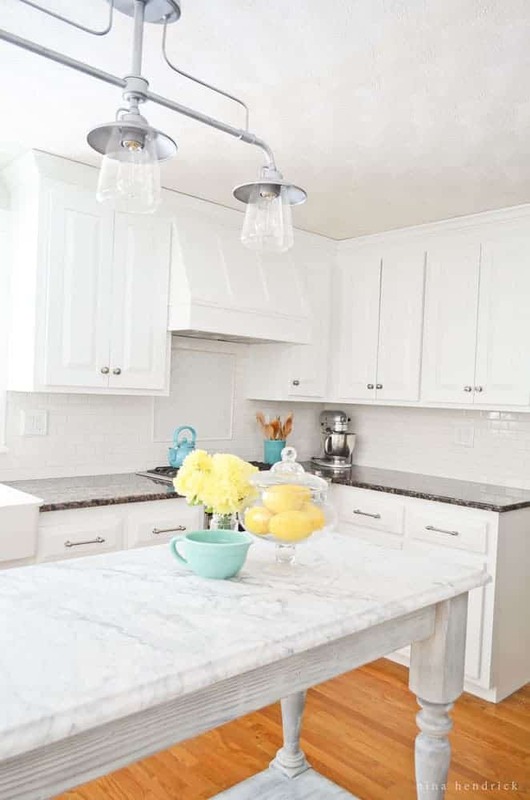 I want a white kitchen desperatly.. 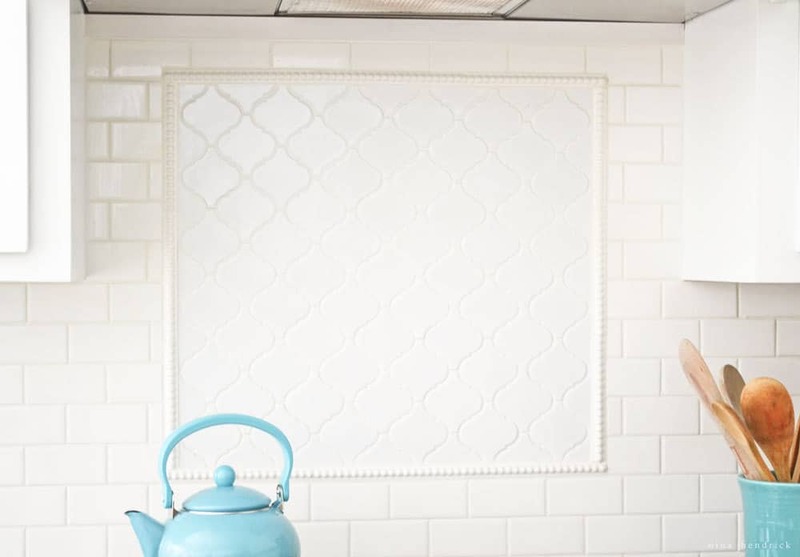 I would love to have my kitchen look like yours.Thanks for this blog. I purchased your guide and sent it to my contractor today. He was skeptical about using the DryDex and said he believed it would eventually detach from the cabinets with all the abuse they get. He suggested that he instead use Bondo (Another blog also recommended this). Can I ask, how are your kitchen cabinets holding up? I’m considering this re-do for a condo we’ll be renting but am nervous about long-term maintenance. I have never tried Bondo and can’t speak to its efficacy, but we’ve been very happy with the DryDex for the past five years! There hasn’t been any detachment. The finish is holding up very well. We are actually in the process of redoing the kitchen (for an unrelated reason, we are adding on and replacing some water damaged walls) and are reusing the cabinets for another project since they still look so good. Best of luck with your project! Love the painted cabinets- I have the 80’s oak home too. Question- Did you paint all the molding in the kitchen and house too? No, but we replaced it all with updated trim. It was made up of two pieces and broken in a lot of places!